Superman journeys to Rann to learn more of the Zeta beam technology that appears to have been instrumental in the abduction of a child in Metropolis. What he is told is discouraging, but even in the face of his own destruction, he bravely makes the attempt to learn as much as he can. The process takes the Man of Steel into a virtual reality inside his own mind – a world where Lois Lane’s reputation for misspelling is exaggerated to the point of caricature. In this world, Superman relives his worst defeats: the boy who jumped attempting to fly; Doomsday; his inability to return to the past and prevent Krypton’s destruction. But it’s the kind of risk Superman needs to shake the clues loose in his head. 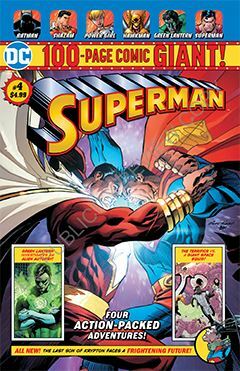 It’s a surreal story, which provides a bit of dues ex machina to tell Superman where to go next. mAybe it’s a cheat, but I’ll wait until I’ve read the final chapter before rendering judgement. The artwork reminds me of Superman as seen in the Dark Knight Returns. I may be off base as I’ve read the story only once, but I see similarities between the work of Kubert and Hope and that of Miller and Janson. Perhaps it’s by design, or maybe someone just appreciates that series. Your mileage may vary.